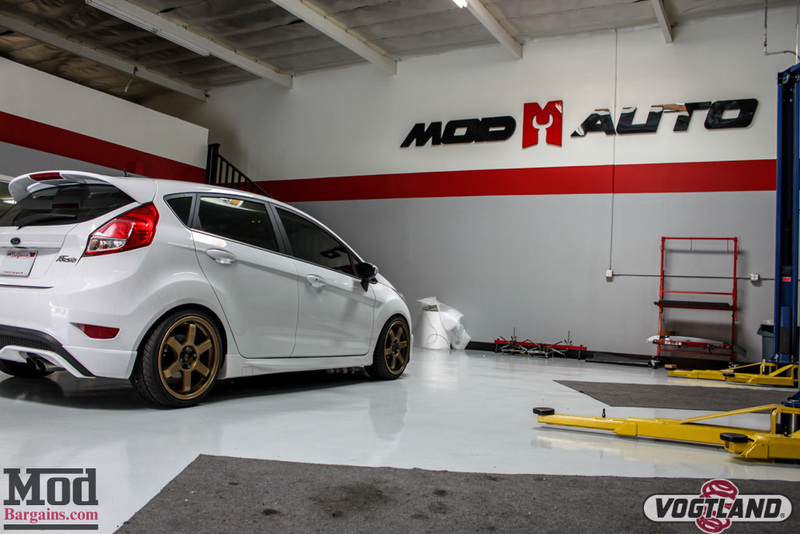 We first introduced you to Dave R’s Fiesta ST a few months back when we installed a set of Vogtland Coilovers for Fiesta ST and a set of gold Rota Wheels to go with the drop. 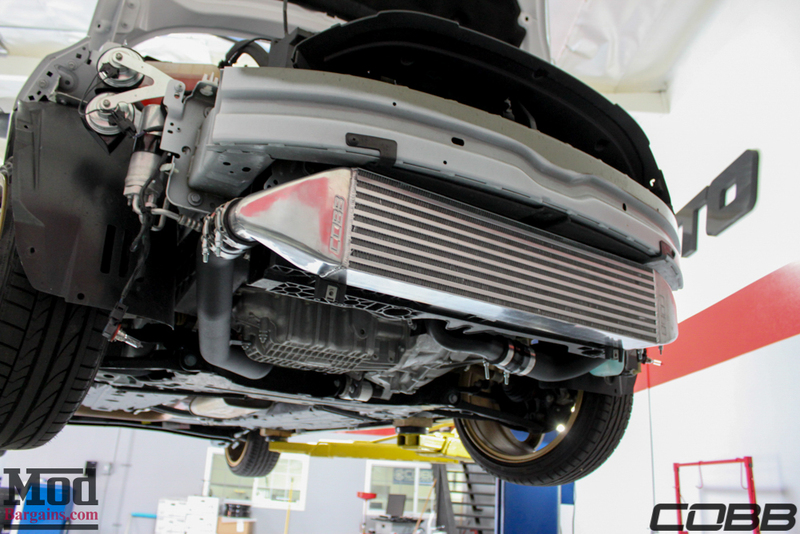 Today Dave came back to give the car some extra muscle with the full Cobb Tuning Stage II suite of parts for Fiesta ST. The Mod Experts helped Dave source all the goodies for the install. The Vogtland Coilovers are holding up great, even after months of use. 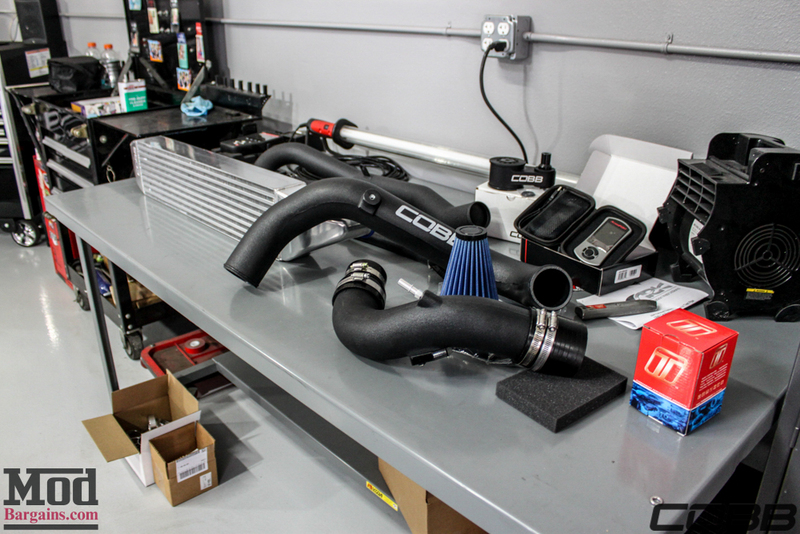 Take a look at the spread of goodies we have laid out – Intercooler, RMM, AccessPORT, Intake… the whole kit and caboodle! Plus, there’s a Turbosmart Kompact BOV for Fiesta ST in there as well. 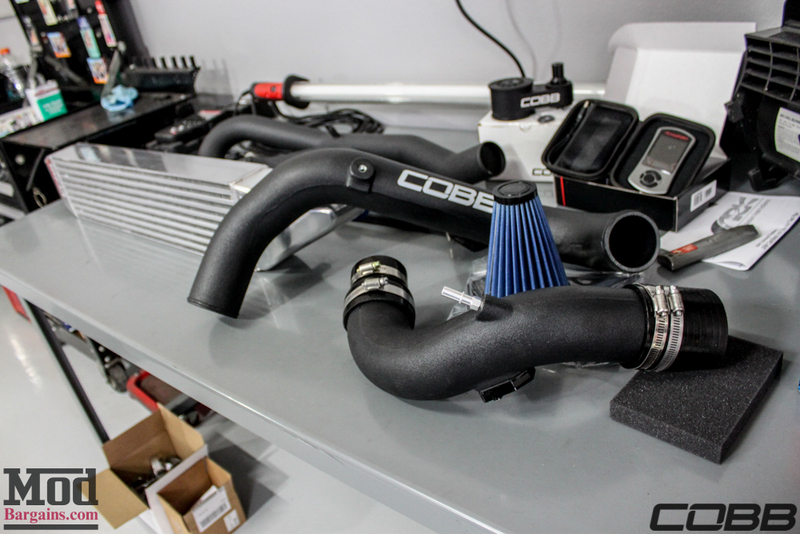 The full Cobb Fiesta ST Front Mount Intercooler + Chargepipe kit is the optimal way to upgrade the intercooler, as it gets rid of the restrictive ‘resonator donut’ in the hotside chargepipe. 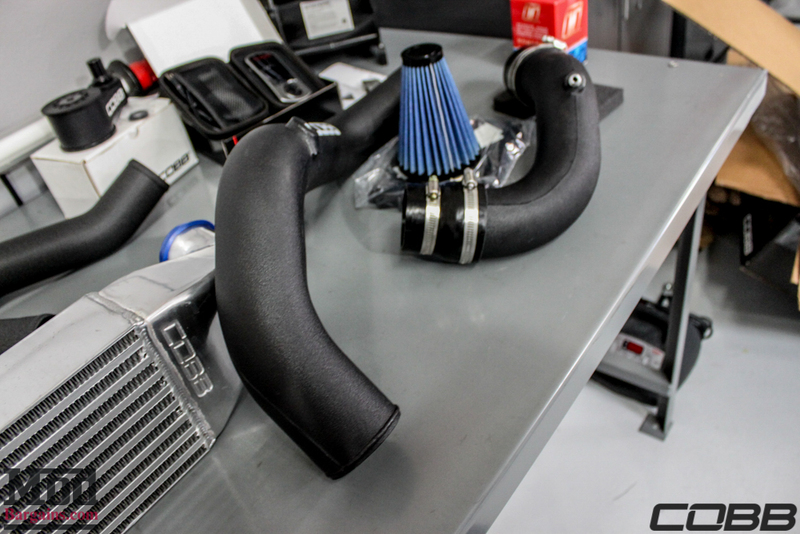 The COBB Intake for Fiesta ST is unique amongst all the intakes on the market in that all of the intake tubing is injection molded plastic, which is a great insulator against heat, rather than aluminum like nearly every other system on the market. 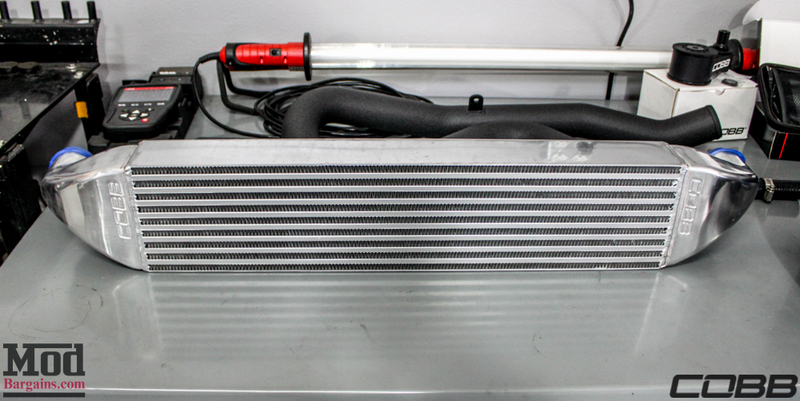 The COBB Front Mount Intercooler for Fiesta ST is the single largest-core, direct-fit intercooler available for the Fiesta ST and offers a dramatic drop in air charge temperatures. 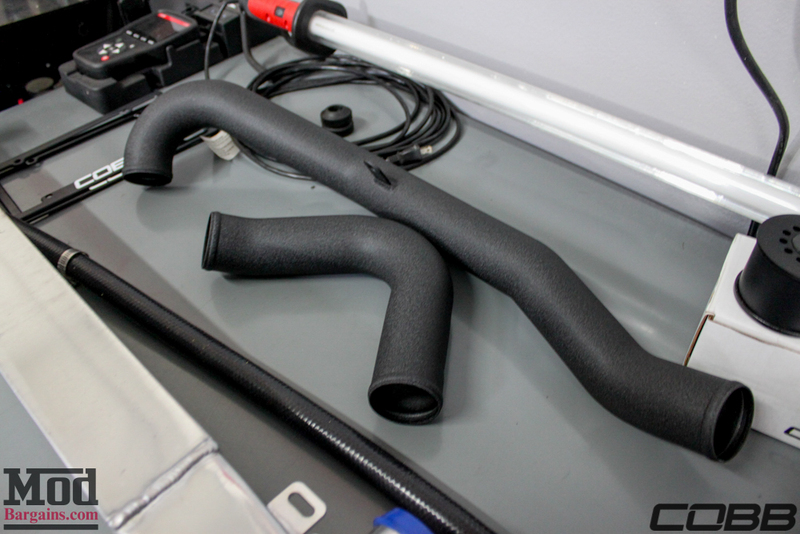 The Cobb Hotside/Coldside Chargepipes for Fiesta ST are mandrel bent to eliminate any pinches that might impede the flow, and the streamlined tubing helps contribute to faster spool up and better throttle response. Installing the Fiesta ST front mount intercooler is surprisingly easy; just remove the front bumper (it all comes off in ONE PIECE if you do it right) and the OEM one unbolts, you bolt the Cobb one in – it’s quite painless, as our installer was able to do a complete FMIC install on a Fiesta ST in under two hours, which should tell you something. 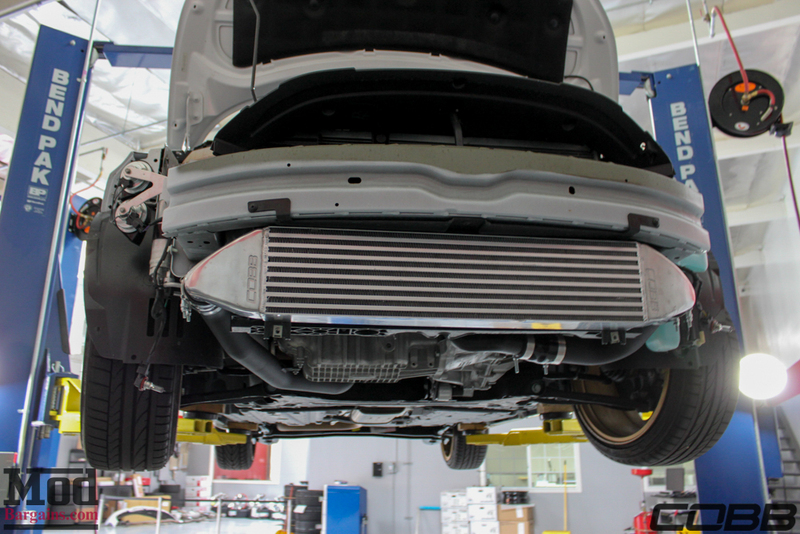 (If you’re not comfortable installing your FMIC yourself, we’re happy to do it for you, call 714-582-3330 to schedule your installation or CLICK HERE to use our online system) Here’s how the FMIC looks mounted into place- it fills out all the available space in the OEM front bumper that it can without modifying anything. 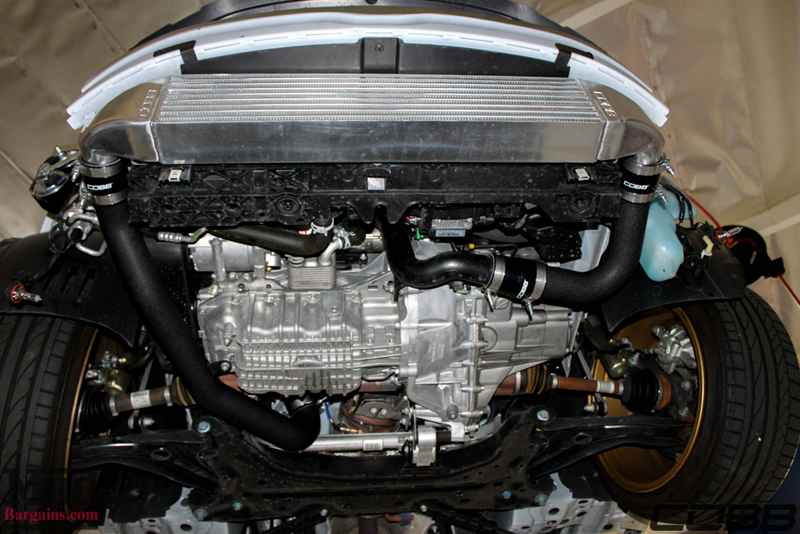 From below, we can see how the chargepipes are routed – the hotside chargepipe on the lefthand side of the photo in particular is where you’re going to eliminate 2kpa of pressure drop. 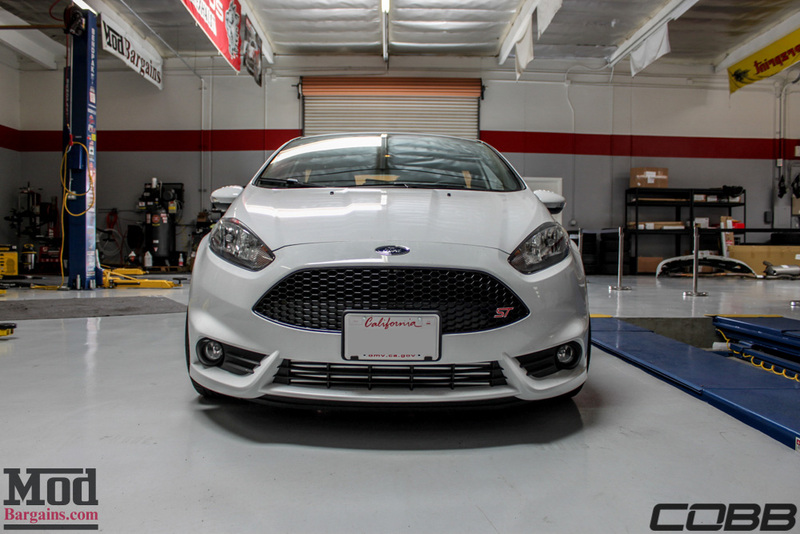 After the chargepipes, we installed the Cobb Rear Motor Mount for Fiesta ST to ensure the car got all that Cobb Stage 2 For Fiesta ST power to the wheels and not wasted on the sloppy OEM “Roll Resistor”/Rear Motor Mount. The Cobb Rear Motor Mount for Fiesta ST eliminates the slop of the OEM unit and the nasty bang you get in lower gears when shifting quickly. Check out this video explaining what the RMM does for the ST below. Next up was installing the AccessPORT and Stage II maps. 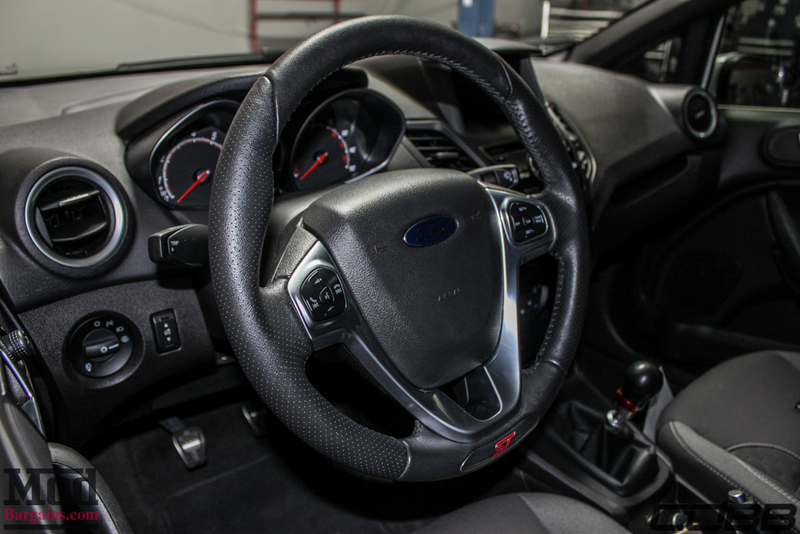 As we sat down to install the Cobb AccessPORT for Ford Fiesta ST with the Stage II “Off-The-Shelf” tune for 91 octane, we noticed the car already had a Cobb Shift Knob for Fiesta ST installed. 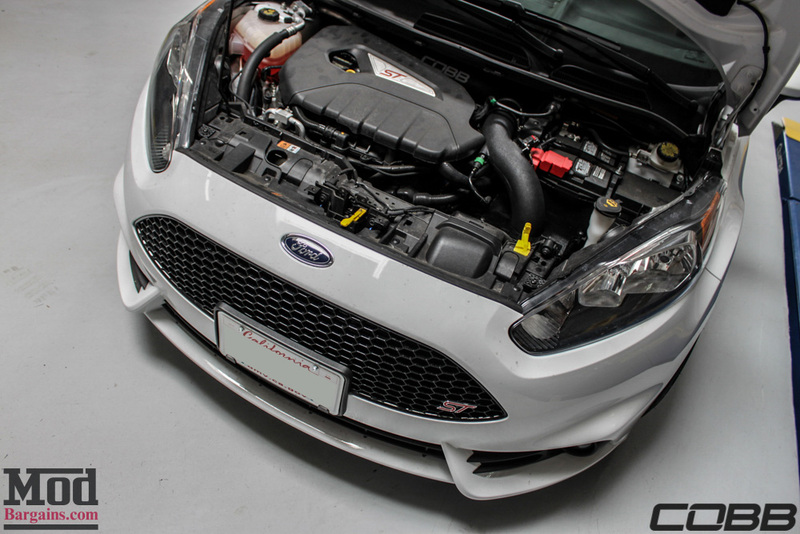 Here’s how the COBB Intake for Fiesta ST looks installed. Up close, you can see how the Cobb intake reuses the OEM lower airbox with a special plate to create a true “sealed airbox” class intake, which is ideal for ensuring a consistently cool intake air charge. 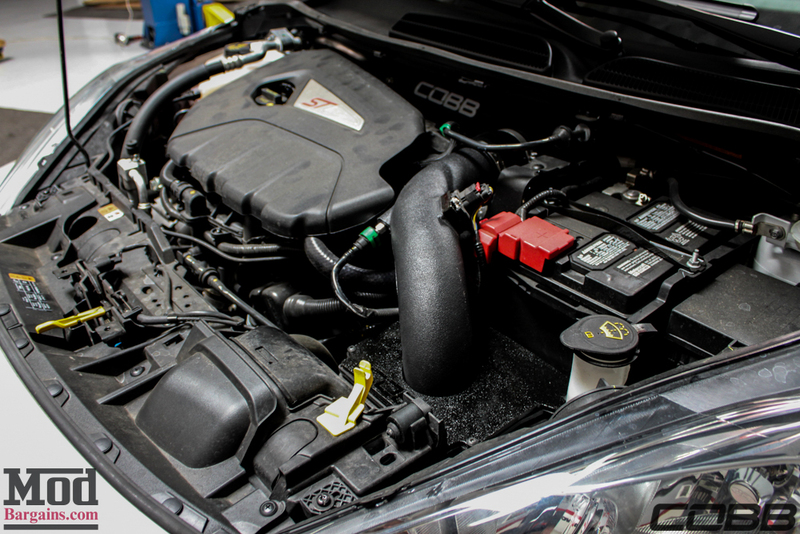 The COBB Intake for Fiesta ST is also one of just a few that has pending CARB E/O Certification, meaning you’re smog legal too – when you eventually have to smog in another 5-6 years from now. With the front bumper reinstalled, you can hardly tell Dave’s FiST is hiding the massive COBB Intercooler behind the front grille. And of course, the car still looks great on the Vogtland coilovers. 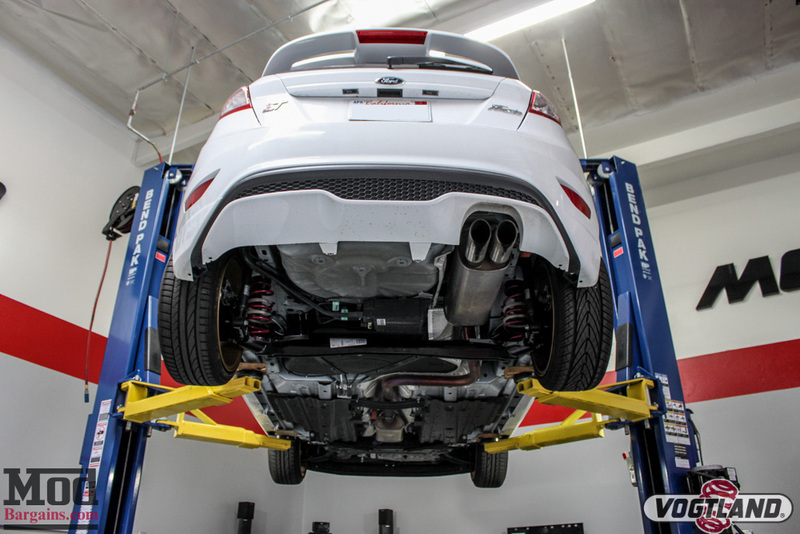 Interested in getting more power out of your Fiesta ST? Need something installed? Talk to the Mod Experts, give us a call at 714-582-3330 to chat with our team of experts or stop by the ModAuto showroom in La Habra CA any day during business hours.